A lot has changed For Icon for Hire since they released their self-titled album in 2013. In late 2016, drummer Adam Kronshagen left the band. Aside from the lineup change, the band is now independent, having left longtime label Tooth and Nail. Having just released their third record- You Can’t Kill Us in late 2016, the band has hit the road for the tour of the same name and it recently hit Indianapolis’ Emerson Theater. Now with just singer Ariel, guitarist Shawn Jump and a touring drummer, the band is still just as dynamic live and they’ve brought October Sky and Assuming We Survive out with them. The show started early and after a few local openers kicked things off, October Sky hit the stage and, with just two members, they blew the crowd away. They’re pure electronic rock and their sound is much larger than just two guys. They had a really strong Nine Inch Nails feel to them and the crowd obviously wanted more. Then Assuming We Survive took over and cranked the energy even higher than it already was. Jumping around the stage, holding hands with the front row, joking with each other and more, AWS was on fire and their energy was infectious. If you hadn’t heard of them or seen them going into the show, you were an instant fan. 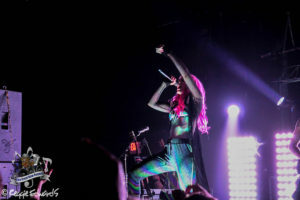 Then the time had come for Icon For Hire to take the stage. As the lights went down and the band took the stage, the crowd erupted and the party had begun. They played for a good hour and some change and played every major song the fans wanted to hear. They even did a small acoustic set in the middle, where they let the fans choose between “War” and “Make a Move,” to which the crowd chose the latter. The band took a moment to talk to the crowd at one point, thanking them for being there through everything. “We played here back in October and wanted to come back again to say thank you for supporting us, from the bottom of our hearts. When things got tough, we realized that quitting would have meant giving up on ourselves and giving up on you,” said Ariel. To end the show, the band came out and did an electric version of “Make a Move,” for an encore before exiting for the rest of the night. 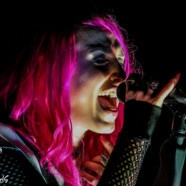 In the end, Icon For Hire have evolved a lot since their self-titled record. A lot has changed for them, they’ve changed a lot and it’s paid off well for everyone. The band is having more fun than ever before and the fans absolutely loved the show.